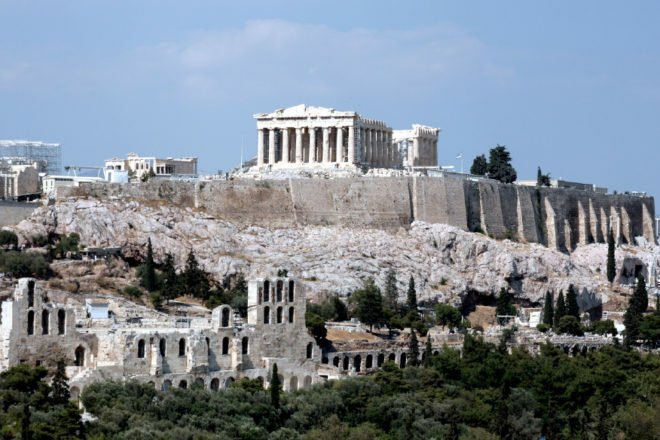 The Parthenon stands sentry over the city of Athens as it has done for 2500 years, but its founders might be shocked by the concrete jungle that has developed a few hundred metres below it over millennia. Sprawling apartment blocks; tiny domed churches; ancient ruins; archaeological digs and box-shaped cars sit side by side to form the 21st-century city. Nothing is spared from graffiti but plunge past the grunge into its alleyways and you may never want to come out. Start the day with breakfast at the Ather restaurant overlooking Monastiraki Square. Get into the Greek spirit with freshly squeezed orange juice and Greek-style scrambled eggs with tomato and feta. Watch the macho power plays between groups of youths and young police officers trying to move them along, and then stroll through the square, a base for the milling masses, where fruit sellers pile carts high with ripe strawberries. 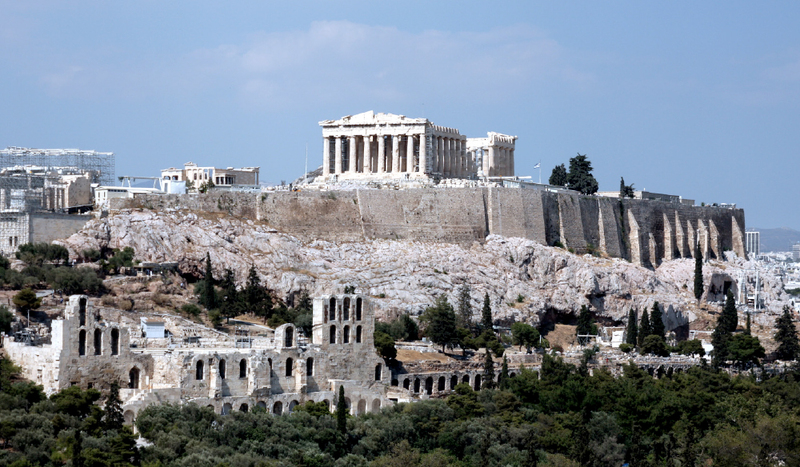 It’s time to climb the gradually winding path to the Acropolis standing in splendour at the top of the hill. The walk is less arduous than it looks from the ground. Choose sensible shoes, not thigh-high suede boots as one sightseer wore. 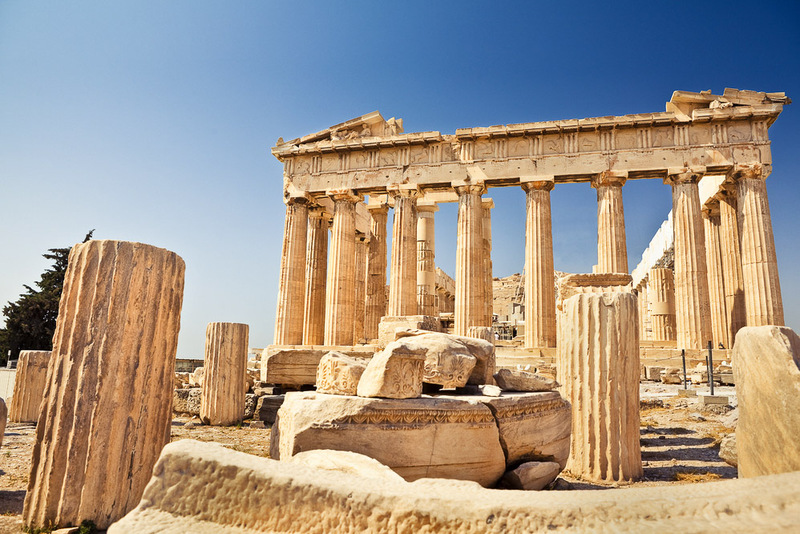 Marvel at the beauty of the Parthenon, the Temple of Athena Nike and the Erechtheion, with its six replica Caryatid maidens balancing the porch on their heads. The original Caryatid columns are at the Acropolis Museum. Walk down the south side of the Acropolis past the Theatre of Dionysos to the contemporary Acropolis Museum, where you can peer through Perspex floors to excavated ruins below. Original artefacts, statues and sculptures from the Acropolis are on display throughout the museum, including the Caryatid maidens, which, each with their own style of thick plait, were modelled on real women from Karyes. One of the statues, stolen by the British Lord Elgin in the early 1800s along with other antiquities, stands alone in the British Museum in London. Grab a table outside for lunch on the terrace at the Acropolis Museum restaurant overlooking the Acropolis. As you promenade down the Dionysiou Areopagitou Boulevard towards the east, pass stylish town houses, restaurants and shops, and buy a crown of olive leaves for the fancy-dress box from a stall along the way. At the Temple of Olympian Zeus, on the east side of Hadrian’s Arch, the complex’s imposing Corinthian columns, measuring 17.25 metres tall and 1.7 metres in diameter, give true meaning to the word awesome. The Hotel Attalos bar is the perfect place to watch the colours of the Acropolis change at dusk as you try to remember your Greek history lessons from school. In the heart of Athinas Street in Monastiraki, the hotel is clean and comfortable with helpful staff and a decent continental breakfast. It is on the doorstep of the gorgeous Plaka and Psyrri neighbourhoods and a short walk from traditional Thiseio and central Syntagma Square. Blue and green chequered tablecloths adorn tables that overflow onto narrow streets from restaurants in the old neighbourhood of Plaka. The cosy Katinikapea restaurant in Christopoulou Street dishes up authentic dishes such as lamb and potatoes and wine in a jug. Our simple but delicious meal was accompanied by a band playing balalaikas and singing ballads for a small but enthusiastic audience. Wander through the cobbled streets lined with shops selling specialty souvenirs: olive oil, vacuum-packed olives and donkey-milk soap, pom pom slippers, linen clothing and leather sandals. Or buy a treasure to satisfy a contemporary goddess, a piece of Dimitrios jewellery from Byzantino. Wake to the sound of church bells pealing from the tiny churches dotted throughout Monastiraki before heading to the fish market in Athinas Street to take in the action. Look out for the old man with twinkling blue eyes and a gap-toothed smile propped at the entrance selling hand-whittled shepherds’ staffs. At the National Archaeological Museum near Omonia Square, the vast collection ranges from the minutiae of life – tiny gold hairpins, decorated with ram’s and goat’s heads, brooches and decorated vessels – to the timeless tragedy of death; an infant’s shroud made from beaten gold and a room full of Egyptian mummies. Seeing, and photographing, the Evzones soldiers who guard the Tomb of the Unknown Soldier in Syntagma Square at the front of Parliament House is as quintessential an Athens experience as visiting the Acropolis. Thick white leggings with black tassels and pom poms show off the slow-motion high-stepping movements of the guard outside what was originally the Royal Palace, neo-classical in style in a pale shade of pink with white trims. The changing of the guards is more elaborate on Sundays when it is accompanied by a band. Lunch in the upmarket suburb of Kolonaki, hiking the steep climb past the suitably grand international embassies that proliferate here. 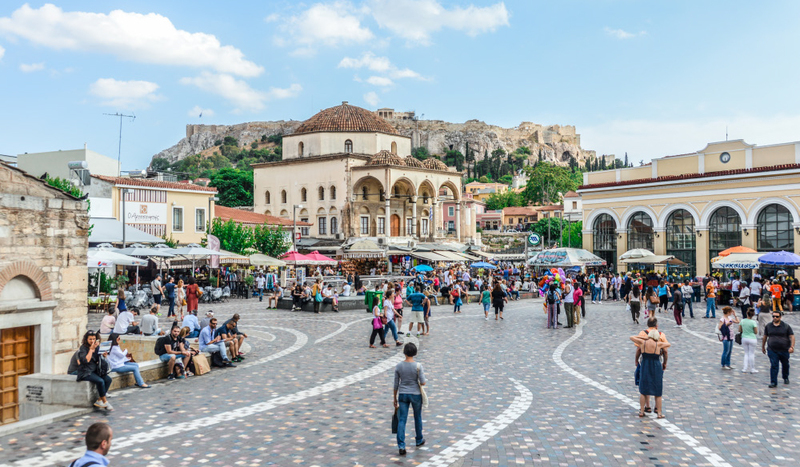 Eat at one of the restaurants or bars overlooking the street in Kolonaki Square, watching as a parade of locals and tourists work their way along it. 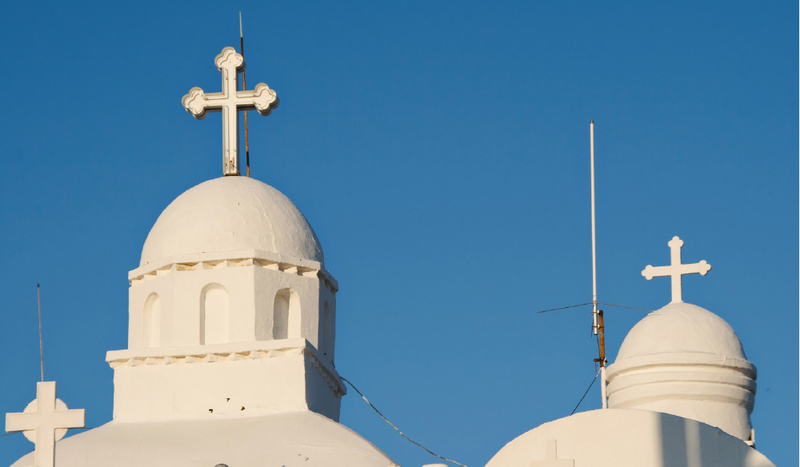 Ride the funicular railway to Lykavittos Hill to be dazzled by the white Chapel of Agios Georgios and the spectacular views of Athens far below. But beware of the dodgy taxi drivers hawking for business at the bottom of the funicular. Everyone loves an indulgent afternoon tea and they don’t come more stylish than at the historical Hotel Grande Bretagne. Step across the mosaic floor in the foyer to the sumptuous dining room, and make sure you take a trip to the basement bathrooms to see old hotel crockery in cabinets and a framed display of ladies’ fans. From silver service to second hand: browse through the stalls of the Monastiraki flea market that leads to the bookshops and retro shops – crammed with old maps and household items – of Thissio. Order a pre-dinner drink at the long bar of the James Joyce Irish Pub in Astiggos Street; Joyce’s masterwork novel Ulysses was inspired by Greek poet Homer’s Odyssey. Delight in home-cooked meatballs, crusty bread and a Greek salad topped with a block of feta cheese, with wine served in a copper jug, at a streetside table at the Taverna Tou Psyrri in Eschilou Street. From this prime viewing spot you can sit back and watch the lively action on the street. A great way to finish the night is by listening to some music at the Jazz CafE Bar on the corner of bustling Iroon Square. Drink a night cap or two before ambling back to Hotel Attalos just around the corner.